The wonderful historic church of All Saints is often overlooked by visitors to the stately home of Harewood House, near Leeds. 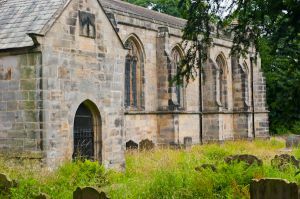 That's a real shame, because All Saints is a fantastic medieval building, and it features perhaps the best collection of Elizabethan alabaster tombs in the country, commemorating the owners of Harewood and the neighbouring Gawthorpe estates. The exterior of All Saints belies the treasures within. It is a long, low building with a low west tower. It is primarily a 15th-century building, but it incorporates bits of earlier churches on the site. Though the building was restored in 1793 and again in 1862 - the latter time by Sir George Gilbert Scott - it remains an essentially medieval structure. Excavations on the site have turned up numerous early medieval artefacts, including a carved panel thought to be Anglo-Danish (pre-Conquest), and 12th-century column shafts. There are fragments of original 14th-century stained glass, offering a contrast to the late Victorian glass in the west window, produced by the famous Kempe studio. But the best feature of All Saints are the six alabaster tombs. The earliest dates to 1419 and is that of Judge William Gascoine, Lord Chief Justice of England. He is shown in his official robes, bearing a dagger and a purse at his belt. Each subsequent tomb shows greater and greater sophistication in the carving and the detail of costume. The last tomb chronologically is that of Edward Redman and his wife (c.1510). It seems likely that the likeness of Redman is a true-to-life portrait, a rarity in itself at a time when most effigies were created long after the deceased person's death and were symbolic likenesses rather than actual physical depictions. The detail of costume is simply superb, and as a whole, the effigies at Harewood give a wonderful picture of changing fashions in both men's and women's costume and armour in the late medieval and early Tudor period. On the north wall is a much more modern memorial, to the 6th Earl of Harewood and his wife, HRH Princess Mary, sister of George VI. Both are buried here. All Saints is not used for regular worship and is in the care of the Churches Conservation Trust. 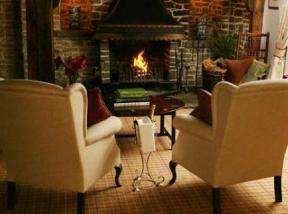 Location: 7 miles north of Leeds off the A61 in the grounds of Harewood House. Turn immediately right after the ticket barrier.